Netflix has announced the first Chilling Adventures of Sabrina holiday special. The episode is called A Midwinter's Tale and it will premiere on December 14th, exclusively on the streaming platform. This is excellent news for followers of the hit series, who were left wanting more after binge watching the first season. Luckily, fans didn't have to wait very long to learn that Season 2 is already being filmed. And now, Christmas is coming early in the form of a new Chilling Adventures of Sabrina episode. 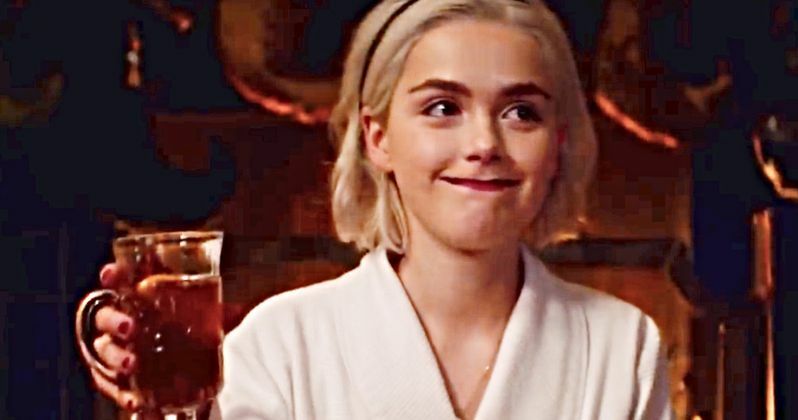 Chilling Adventures of Sabrina producer Roberto Aguirre-Sacasa made the announcement on social media by saying, "Praise Satan! I mean, Praise Santa!" Aguirre-Sacasa is clearly excited about the holiday special and also posted a picture of the cast in an animated Christmas card. Netflix later released a synopsis for the special episode. There are hopes that the Chilling Adventures of Sabrina holiday special will help set up Season 2, which will debut sometime next year. We've already seen what Thanksgiving looks like for the series, so a Christmas episode seems like another good fit, which will also serve as an early present to fans. We might even get some more insight into the relationship between Sabrina and her family, showing more about the Spellman family bond. Chilling Adventures of Sabrina has been in the middle of some controversy over the last few weeks. The Satanic Temple is suing Netflix and Warner Bros. over the use of a Baphomet statue that they believe is a rip-off of their own design. However, the Church of Satan has released a statement in defense of the show, claiming that the Satanic Temple is just pulling off a publicity stunt to get attention. The Church of Satan is not affiliated in any way with the Satanic Temple. Regardless, it doesn't look like the lawsuit is going to generate the $150 million that the temple is demanding. Now, with the Church of Satan on its side, Chilling Adventures of Sabrina is embarking on a holiday special, which is sure to bum out some of the people over at the Satanic Temple. Christmas is coming a few weeks early to followers of the hit series, so get ready to see what evil lurks in the special episode. Netflix also released a short holiday sizzle reel promoting their upcoming material, which features some quick looks at the holiday special, and you can watch that below, thanks to the Netflix streaming YouTube account.